LUGANSK, November 24. /TASS/. Head of the self-proclaimed Lugansk People’s Republic (LPR) Igor Plotnitsky has resigned due to health problems, LPR State Security Minister Leonid Pasechnik said in a statement published on the Lugansk Media Center website on Friday. "Today, Igor Plotnitsky has resigned due to health problems, aggravated by numerous battle injuries and concussion consequences. In accordance with his decision, I come into office as the republic’s head until the coming election," the statement says. Pasechnik thanked Plotnitsky for his decision and the credence given to him. "Igor Plotnitsky has made a great contribution to the peaceful settlement process. He is one of the Minsk accords signers. He has been appointed plenipotentiary of the Lugansk People’s Republic for execution of the Minsk accords," he noted. Igor Plotnitsky has been appointed an envoy for the implementation of the Minsk agreements. "He is among the signatories to the Minsk agreements and was appointed today the Lugansk People’s Republic’s envoy for the implementation of the Minsk agreements," the statement said. "I also state my adherence to the Minsk accords. The republic will be consistently executing the obligations taken under these agreements," Pasechnik pointed out. In his statement, he also stressed that "the Board of Ministers, the LPR People’s Council and other power structures continue operating on a routine basis." "For my part, I want to assure the LPR residents that I will do everything possible for the Lugansk people’s welfare," Pasechnik concluded. Leonid Pasechnik has been appointed acting head of the Lugansk People’s Republic until forthcoming elections. The People’s Council, or legislature, of the LPR has received Igor Plotnitsky’s letter of resignation as head of the republic and appointment of Leonid Pasechnik as acting head, the Council’s speaker, Vladimir Degtyarenko, said in a statement posted by LuganskInformCenter on Friday. "I have no doubts that the People’s Council will support the candidature of Leonid Pasechnik as acting head of the Lugansk People’s Republic. All necessary amendments will be done to the normative acts immediately," the statement said. Igor Plotnitsky was born on June 24, 1964, in the town of Kelmentsy, Chernovtsy Region. He graduated from the Penza High Artillery Engineering School and the Vladimir Dal Eastern Ukrainian National University. Igor Plotnitsky served in the USSR Armed Forces. Since 1991, he has lived in Lugansk and worked in various commercial organizations and the Lugansk Regional Inspectorate for Customers Rights Protection. When "Euromaidan" supporters came to power in Ukraine, he became one of the opposition leaders in Lugansk. He served as the Defense Minister of the self-proclaimed Lugansk People’s Republic and then was appointed as the LPR Prime Minister by the LPR Supreme Council. 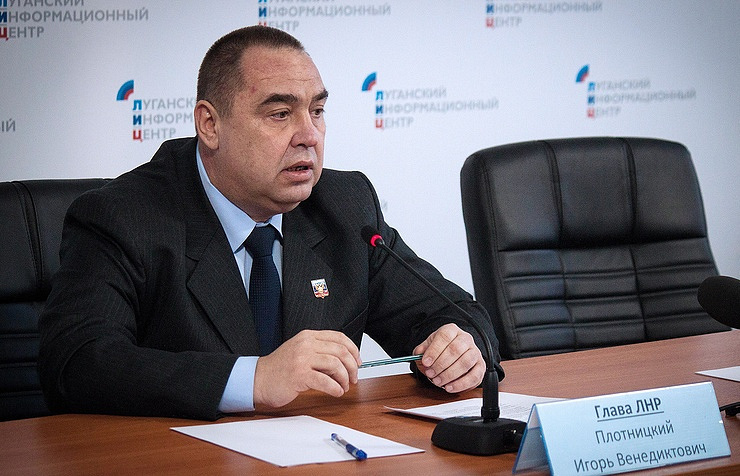 On November 2, 2014, Plotnitsky was elected the LPR head.